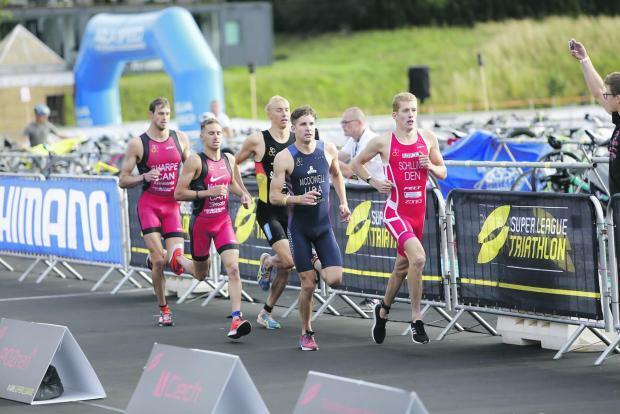 Triathletes complete in the Super League Triathlon qualifying event held in Poznan, Poland, earlier this month. The world’s leading triathletes will be travelling to our islands this year as Malta has been added to the Super League Series schedule for 2018. Last year, the Times of Malta had reported that the Super League Triathlon directors had been in talks with the Maltese authorities to explore the possibility of holding one of their legs in Malta. After long negotiations, Chris McCormack, co-founder and vice-chairman at Super League Triathlon, told the Times of Malta that a one-year contract has been agreed and Malta will host round two of the series on October 27 and 28. The 2018 Super League Championship gets underway on September 28 with the first leg in Jersey before heading to jersey. The series also has legs in Mallorca, Singapore and Australia. “Malta has been added to the Championship series destinations for 2018/ 19 and we are truly excited about that,” the former triathlon champion said. “Malta is a hidden gem and is truly a beautiful country to deliver an event in. When we think of our series we are always looking at destinations that are visually appealing to our global TV broadcast and give a back-drop that is truly unique and memorable. “When we arrived in Malta all we saw, was how remarkable this would look like when we deliver an event like Super League Triathlon at a venue like this. Malta as round 2 of the series this year is fantastic. “We are truly excited about the event, and more so the feedback from all the professional athletes is this is one destination they are really looking forward to competing on. McCormack revealed that Vittoriosa has been chosen as the venue of the Super League Triathlon Malta that will host the world’s top 25 male and female triathletes, which include the Brownlee brothers, Alistair and Jonny, and Bermuda’s world champion Flora Duffy, in a closed circuit around the marina. The championship pro athletes will compete in an Eliminator race on Saturday, October 27. The Eliminator format comprises three stages of swim-bike-run with a 10-minute break between each stage. The 10-minute break commences when the winner of the preceding stage crosses the finish line. This means every athlete behind the stage winner has less than 10 minutes to recover. The following day they will be involved in an Equalizer. and a swim-run-swim-bike-run sequence as Stage Two. To make it really interesting, athletes must serve a time penalty in Stage Two that is equivalent to any time lost to the winner of Stage One. McCormack said that they have plans to hold an event for the community that will be open for everyone. “We will have a triathlon event for the community to do that is open to everyone and easy to compete in,” McCormack said. McCormack said that Maltese triathletes will not be eligible to compete in the Super League Triathlon Malta but have pledged to start a relationship with the Malta Triathlon Association to attract more local athletes to the sport. “We will not have a Maltese athlete competing this year as unfortunately none are at the level that would allow them to be even slightly competitive,” he said. “What we do hope to do over the next few years is work with Triathlon Malta and the local community to inspire the next wave of star athletes to look at pursuing sport and triathlon as a career choice. “Super League Triathlon will inspire the next wave of Maltese stars to compete and believe they can make it. “Flora Duffy, the current world champion, is a young girl from Bermuda who was inspired by triathlon 15 years ago after a major event like this took part on her tiny island. During their stay in Malta the professional triathletes will also visit Maltese schools to encourage students to embark on a healthy lifestyle. “We will be using our athletes to go and visit kids in schools and spread a message of health and fitness,” he said. We will have training sessions conducted by our athletes who are ambassadors for Super League Triathlon and every venue we visit we really try to utilise these sports stars to help influence and generate positive messages within the community. McCormack said that he has no doubts that the Super League Triathlon Malta will be a major success and he hopes that their relationship with Malta will go beyond this season. “We would like to have Malta as a key race on our championship series for a very long time,” he said. “Like the Formula 1 does, we have multiple cities who host events but we would like to have a level of consistency to our cities and create a history around our events that is interesting and creates a foundation. “Presently we are in discussions to stay in Malta as long as the support is given and we have been told that this support will be long term. This event will be the biggest multisport and fitness festival in southern Europe. “Malta has been very forthcoming as a destination, but we have had a few difficulties in having the general public and local corporations understand the enormity of the event. “We are confident that after year one, all this will change. We hope to stay here for as long as we can.